Snail, snail go away, and never come any other day! "On grass, it can be the small things that decide a match." Caroline Wozniacki was of course, talking about tennis, but she could also be talking about snails, for all we know. As a wildlife biologist, it always amazes me how something so small could wreak such havoc-- take viruses for example. I've seen what these pesky little (since they don't really grow as big in the Philippines) animals can do-- conspicuous bald patches in the vast expanse of rice fields in northern Luzon, and a substantial reduction in potential yield for our farmer-collaborators in Laguna. It is in this vein that our team, The Dark Knight Rices set off on our anti-GAS (golden apple snail) mission-- two days before we transplanted, and 10 days prior to second picking. Because it is our first time (and we were excited), we were at our plot by 6:30 in the morning of the 7th of June. It was a crisp sunny day, and our field was flooded but the water was clear-- perfect for picking snails. It was of course, never without mishaps. I lost footing, and my bottom met the wet mud... I was never well-coordinated to begin with. So much for the paddy boots! Thanks to the clear water, and the papaya leaves we used as bait, we were able to collect quite a bit of snails. Because Alex' lecture about aestivation (it's like hibernation, only that it's done during high temperatures and dry conditions) is still vivid, we opted to kill the snails by, uhm, running them over with the pick-up truck. And since not all snails were crushed, we had a stomping party. I must confess: the sound of shells being crushed was music to my ears! I apologize to those who might be offended, but there was definitely a sadistic satisfaction in seeing crushed snails with flattened pink eggs on the road! I mean, can you imagine how much young rice these things could've chomped on?! The second picking (two days prior to transplanting) was not as productive as the first. Perhaps it was because the water was too murky, so we had to resort to feeling for the snails underwater with our hands. Perhaps we didn't flood the field enough for all the snails to come out of hiding. Perhaps the rest of them heard through the snail grapevine that picking's going on. Whatever the the reason might be, I'm sure it's not because there was much less of them in our plot. It was time, at last, to sow the seeds we got from other people. Team Tagumpay must have been the slowest of the planters because it took us two hours to finish sowing seeds. But to be fair, it was the first time for some of us to even be in a nursery. Even though it was quite hot when the team worked, it was all fun... at the beginning. As the first hour passed, planting rice started getting monotonous. Patience was starting to thin. I wondered how people working in the field handled the slower pace in life. But of course! There's music! One of the bird ladies (women who stayed in the fields to shoo away the birds) started walking about with her portable radio blaring. Just following the woman's lead, I started playing music from my iPad. Maroon 5 was on top of my Dropbox starred music list so I played the band's songs. If wifi signals could reach the nursery, I would have played the classical music podcast; but there was no wifi in the field. One of my group mates, RK, told the rest of the group, that we'd start seeing something the following week. Me being me, I just had to drop by to visit the nursery to see if anything's happening yet. 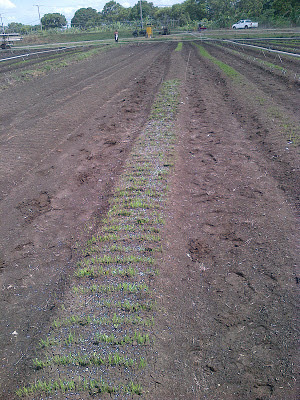 Since it's been only a day after sowing, nothing's popping out of the ground yet. I felt like Sam Gamgee going around the Shire checking the plants he had sprinkled with Galadriel's gift. So, I visited the field again, with Jen and Maya. Five days into planting and green things started emerging from the ground! I had a sigh of relief because we know we'll have something to transplant after 16 more days. Just to make sure that the plants we were going to plant were strong enough to withstand the stress of pulling and transferring to a different field, we gave the plants an initial helping of fertilizer. With the rains just around the corner, these plants will have a lot of challenges ahead of them; so it wouldn't hurt to give them a head start. In seven days, Team Tagumpay will be back in the nursery to give these seedlings another boost of fertilizer. "You've got to get it right at the start..."
Well, I can't say that we, the wet season Rice Survivors, weren't warned. 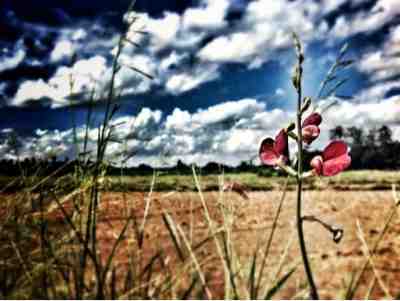 Nevertheless, it is daunting for people who aren't normally in the rice field one day to be planting rice in another. It's a fish-out-of-water experience, really. And today, may I say, the rice grains were out of water as well. 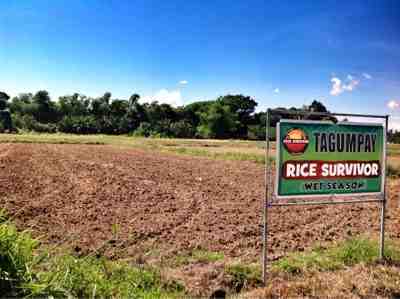 What rice variety was Team Tagumpay going to plant? This is the most important question, I think. There are more than 100,000 rice varieties to choose from... and we only had a small area to plant. Since the aim of the game is maximized profits, we had to base our choice of variety on its past performance (i.e., yield) during the rainy season, its capacity to withstand stresses and its ability to resist diseases. We also had to consider the variety's cooking and eating quality. How were we going to transplant them? And in what type of nursery? The method of transplanting will affect the way we sow our team's seeds. Apparently, if we were going to use the mechanical transplanter, we need to plant in trays specifically designed for the machine. If we were transplanting the manual (traditional) way, there are still choices. 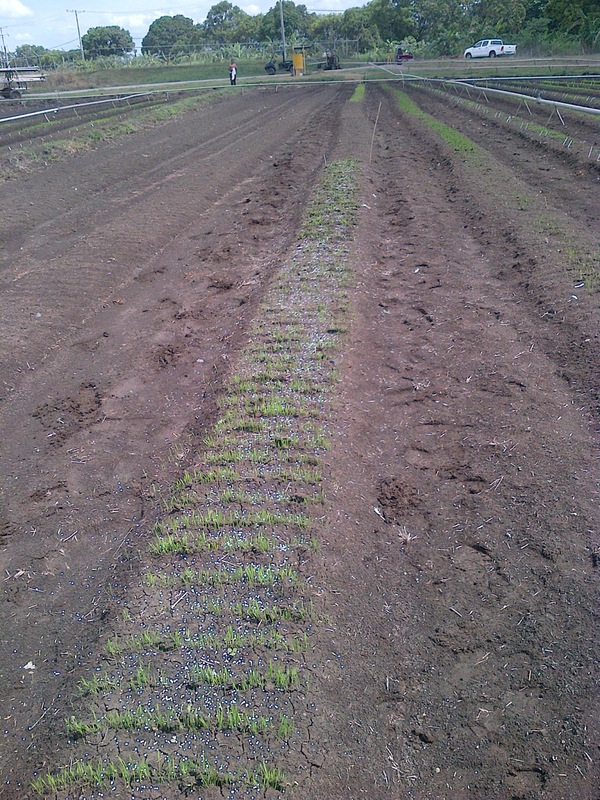 There were wet beds and dry beds which could be used to prepare seedlings for transplanting. I honestly think that the decisions we made are the right answers. Team Tagumpay will find out soon. "So many questions, and the answers are so few..."
After the snails and field measurements, it was time to get this season's Rice Survivors acquainted with farming equipment. Leigh Vial, head of IRRI's Experiment Station kindly walked us through the garage to meet some of the big toys that we might use in the field. Along the way, I saw tractors and farming implements that look familiar... Of course! The tools used to till the land in sugarcane farms are similar to what is used in rice fields. The only difference was that the ones used for rice are a bit smaller. I'm familiar with the disc plow, and only the disc plow, because I used to see that all the time in my grandfather's coffee and peppercorn farm (way back in the 80s). From what I've been hearing during seminars on gender and diversity, it looks like the farms are mainly managed by women: they till the soil, they plant and take care of the crops, and they harvest the grains. But the machinery I'd seen so far during the tour looked like they're more suited for men. And men are the ones migrating to the urban areas for work, according to the seminars I've been sitting in. So there, apparently, is a mismatch... Unless, of course, the women are the ones operating the machinery themselves. But then there were machines that didn't need a tractor. There was a hydrotiller, that looks like it can be pushed through muddy paddies quite easily, and mechanical transplanters. Yes, mechanical transplanters! If these machines are widely available and accessible, I'm thinking that farming will be a little bit less backbreaking than it is now out in the real world. So, why the quote from the Side A song? During our tour, Rice Survivors were seeking Leigh's advice about how to properly till their fields. But there's no clear cut answer, according to Leigh. Looks like there's a certain degree of gut feel and guesswork involved. For scientists and researchers who are used to linear thinking and to flow charts (like me), diving into the unknown without a clear guide is quite scary. I guess that we'll be winging it a lot of times this season. We'll see. Contrary to popular belief, snails are not slow, particularly at chomping off plant parts. That's what I learned, though it's implicitly said, during the first field exposure of the wet season Rice Survivors. During this activity, Alex Stuart, a snail expert, walked us through the importance of keeping snails out of our rice field. There are several strategies, it turns out. Two strategies that I remember are (1) kill the snails with pesticides; (2) pick the snails by hand (yes, you read that right... by hand!). A third approach involves collecting the pink snail eggs and crush them before snails start to hatch. I still don't know how my group is going to banish those snails from the rice field assigned to us. But one thing's for sure: rice production is not as simple as it seems. The first outdoor activity was about about field measurements. Simple enough, or so I thought. Normally, I would instantly grab measuring tape to get the dimensions of the field. Apparently, however, there are more ways than one for measuring one's field. My groupmates used measuring methods that ranged from the crude to the high-tech. Aside from measuring the field by counting one's steps (and multiplying it by his/her pace factor), we also measured the field using waypoint averaging... yes, we got a lot of measuring help from up above. Of course, we also measured the field using a tape measure, just cover all methods available to us. Not surprisingly, we all got different measurements for field area. Which one to use, I don't know. But I'm thinking (I'm sure my groupmates are also thinking the same thing) we ought to go back in there once the land preparation is done to get final measurements and in preparation for field lay-out. In our initial calculations for the area of the field, Google Maps was used as a tool to see the field from high up. The high-resolution image and the lengths that we've obtained using the tape measure confirmed what I have suspected since I first saw the field: we were facing a potential trapezium, given four unequal sides and whose angles are unknown. Why didn't I bring a protractor that day?! Anyway, after all that hard work (and I know we're facing a steep learning curve here; more challenging days to come), we did enjoy the morning out in the field. Photography enthusiasts were snapping away (including me, albeit with a tablet).